Note: There is a parish of the same name in Ross-shire. 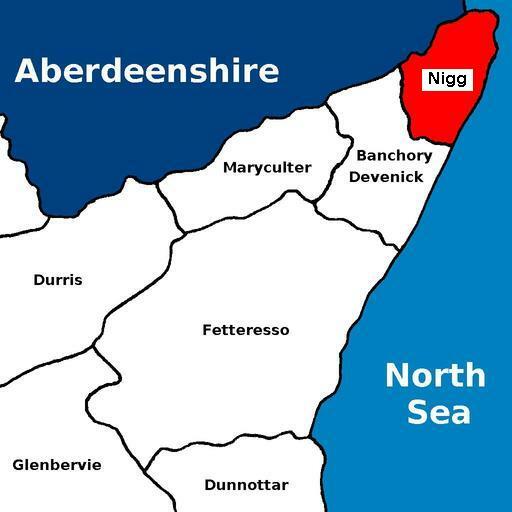 For the full range of maps of Nigg, see National Library's Maps. Copies of the old Ordnance Survey plan of Aberdeen (Ferryhill & Torry), dated 1900 & reduced from 25 inches to the mile to about 15 inches to the mile can be bought from Alan Godfrey Maps. The plan includes the built-up area of Aberdeen south of the River Dee. These are not coloured maps. Geograph.org: Nigg - recent photographs of Nigg. National Grid ref. NJ9604. Geograph.org: Torry - recent photographs of Torry. National Grid ref. NJ9404. Geograph.org: Cove Bay - recent photographs of Cove Bay. National Grid ref. NJ9500. Nigg Kirk (now closed), built in 1829, is at NJ947031. Photograph. The ruined St Fittick's kirk is located at National Grid ref. NJ963049. It belonged to the Abbey of Arbroath. Full texts of all extant inscriptions in St Fittick's Kirkyard, Nigg have been published by the Aberdeen & North-East Scotland FHS. They have an online search facility for names of people on the monuments they have recorded. Their list of publications is here. See also Nigg Churchyard and St Fitticks Churchyard. Nigg was in the Commissariot of St Andrews. The list includes some people who may have been residents of Torryburn FIF, rather than Torry in Nigg KCD.